This weekend, when I felt like spending some time in the kitchen, I decided to let the ingredients in the fridge speak to me. I knew I wanted to craft something vegetarian, and wanted to work with what I had. 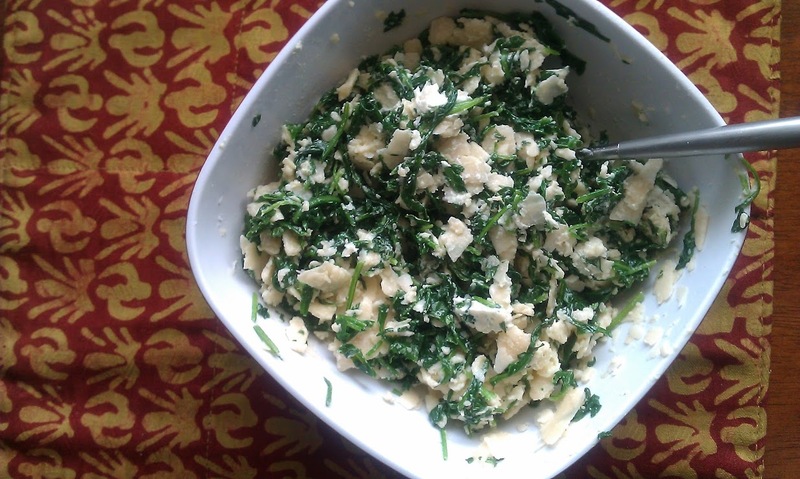 The ingredients that automatically jumped out at me were arugula and goat cheese. I’ve been eating the two together as a lunch side lately, tossed with some homemade creamy balsamic vinaigrette. They seemed like a good pairing for the basis of a strong vegetarian dish, and I had just the pasta for it: lasagna noodles. I’m always looking for creative new uses of lasagna noodles, because, while I really enjoy lasagna, I don’t always feel like making a dish that large. 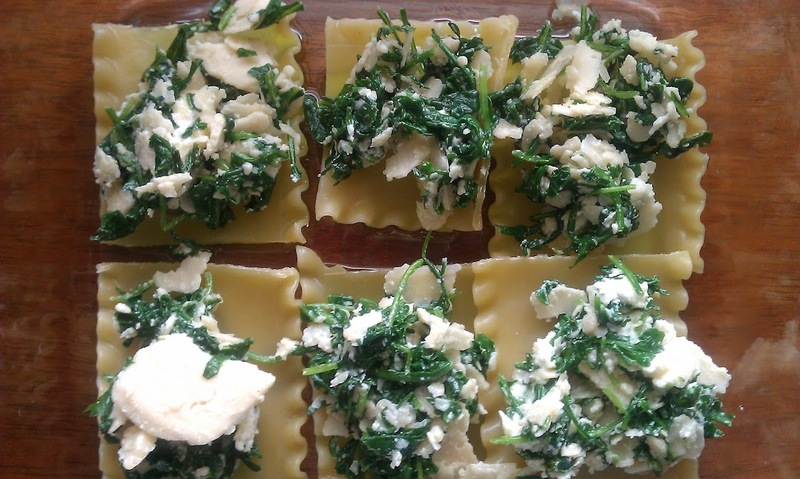 A few weeks ago, I tried, and liked this recipe for individual spinach lasagna rolls, so I wanted to use the arugula and goat cheese in a similar free form way that would require even less work on my part. I wanted to make a filling, and then just kind of throw it all together. Hence, my fake-out arugula and goat cheese ravioli was born. Start cooking the lasagna noodles. Drain and lay out flat on a plate or towel to dry. While you wait, prepare the filling. Heat olive oil in a 12-inch heavy skillet over medium heat. Add garlic and cook, stirring frequently, until garlic turns golden brown, 1 to 2 minutes. 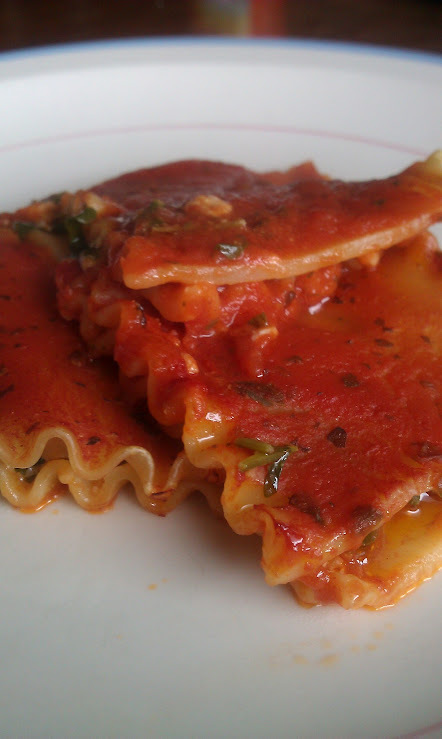 While the arugula is cooling, cut the cooked lasagna noodles into four squares each (for a total of 32 squares). Preheat the oven to 375 and grease a 9 x 13 inch baking dish. Lay half of the lasagna squares out along the bottom of the dish. 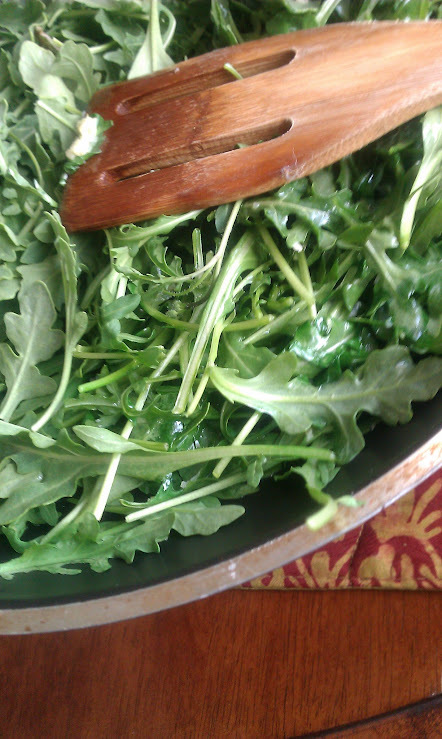 Stir the cheese into the wilted arugula, and spoon a tablespoon-sized dollop into the center of each square. Cover each with another lasagna square, then spoon the sauce over the whole thing. Pop it in the oven and bake about 15 minutes, until heated through. Enjoy! I love this recipe and the idea behind it. The great part about the free-form style is that it doesn’t matter how messy you get, which is especially valuable for me in the kitchen. The building is also relatively speedy because of this. But on the other hand, you could also really easily transform it into a traditional lasagna, or the filling for a real ravioli, if you have the equipment to make those from scratch, and make it a pretty fancy, company-worthy meal.